I purchased my first and only HDTV nearly six years ago. Before the purchase I scoured forums for months (mostly on AVSForum) to find out what others were saying about various TVs. Many flat panel LCD and plasma displays were cost-prohibitive for my budget, and the ones that weren’t had mediocre features and image quality. I finally purchased a Sony SXRD rear-projection HDTV in early 2008. The TV had great picture quality, solid reviews, and a 120hz refresh rate—not very common back then—with true 1080p24 support (for the home theater purist in me). Everyone was saying that I would get a couple of years out of the projection lamp before I’d have to replace it for a few hundred bucks. To my surprise the lamp lasted until just last week! Then one night, instead of displaying a beautiful HD picture, the TV just sat there with a red LED blinking under the screen. I suspected that the lamp finally gave up, and a quick check in the manual verified it. 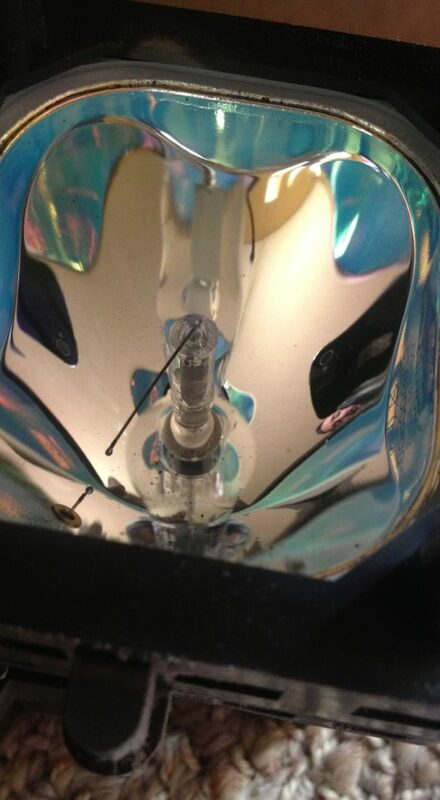 If you look closely, you can see the melted wire inside the bulb housing. The manual suggested that I check the manufacturer’s website for a replacement lamp. Sure enough I could order a replacement for $299. I’ll admit that for a second or two I considered buying a new TV. After all, HDTVs have come a long way in six years. 240hz refresh rates, LED backlighting, less than 1″ thick, 3D support, built-in internet-connected apps like Netflix and Pandora, etc. It was tempting. Ultimately I decided (with some sound reasoning from @sjohnson85), that I’d be much better off spending a few hundred dollars for another 5 years of TV watching than dropping a few thousand for a comparable new model with a handful of features that I don’t really need. Before purchasing a replacement from the manufacturer, I did some shopping and forum research (back to AVSForum) to see what options were available. Amazon had some $35 – $50 knock-off replacement lamps that seemed to last several months to a year based on reviews, but I wanted an OEM-quality lamp that would provide a clean, bright picture for several years. 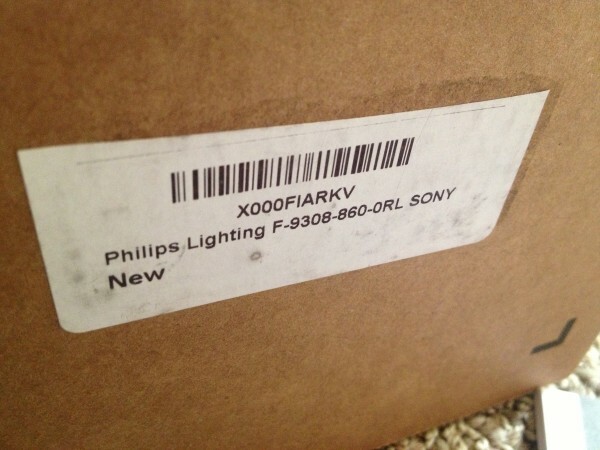 Eventually I came across a helpful forum post that pointed me to a replacement lamp made by the OEM but for significantly less than the one on Sony’s website. The Amazon listing had good reviews, so I decided to take a chance on it. Philips manufactures the lamp used in my Sony TV. 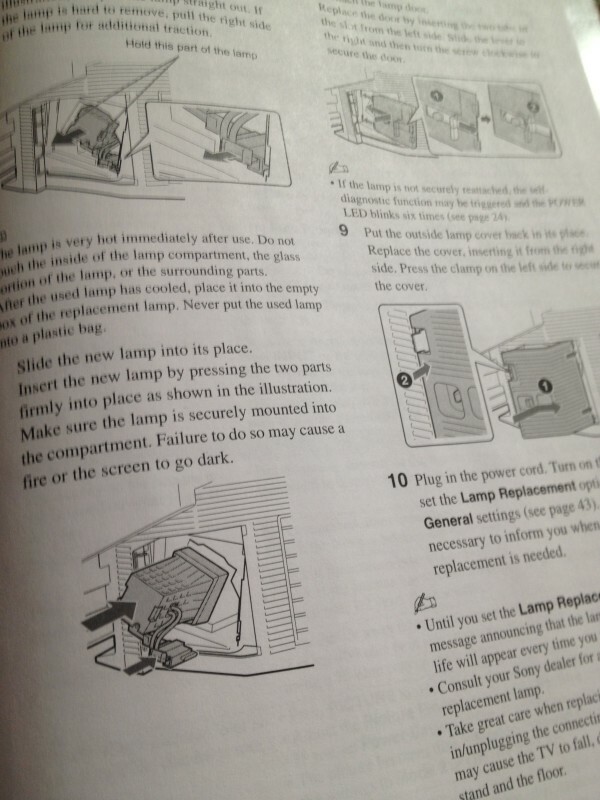 Once the lamp arrived I flipped open the manual and read through the replacement process. I had heard it was easy to do, and after reading through the steps in the manual it was obvious that this was a quick repair. The hardest part of the process was pulling my TV far enough from the wall so I could unplug it. The replacement lamp was installed in just a few minutes. The instructions for replacing the lamp are very easy to follow. Even though it’s only been a couple of days, I have a good feeling that this lamp is a quality product, and I’m looking forward to seeing how long it will last! 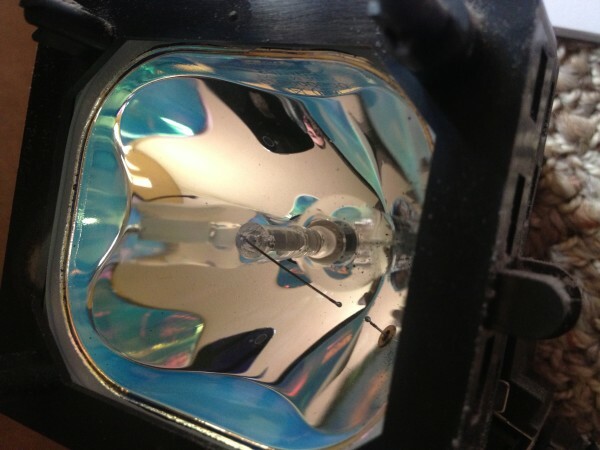 Has anyone else had to replace a lamp in their rear-projection HDTV?